As we all know, it is really convenient to play DVDs on devices that support iTunes such as iPad, iPhone or iPod Touch. Whenever you need it, you can always access them easily. 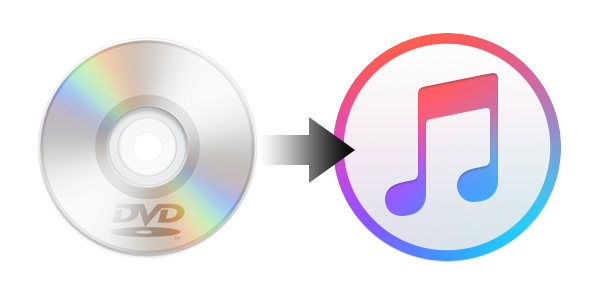 Though iTunes is a popular media player and media library application, which is used to play, download, and organize digital audio &video, but iTunes cannot rip movies from DVD to iTunes directly. Even worse, most DVDs are bogged down with copy protection, making it more difficult to rip DVD movie to iTunes. Then there comes to the question: Is it possible to rip movies from DVD to iTunes? How to rip movies from DVD to iTunes? Luckily, there are some good programs in the market available to rip DVD movie to iTunes Mac users may like. Hereby, I’ll discuss some of them in this article. Keep reading on to find out how to rip movies from DVD to iTunes. Note: As Macs don’t come with optical drives anymore, so you’ll have to buy an external one. Any USB DVD drive will work for you. 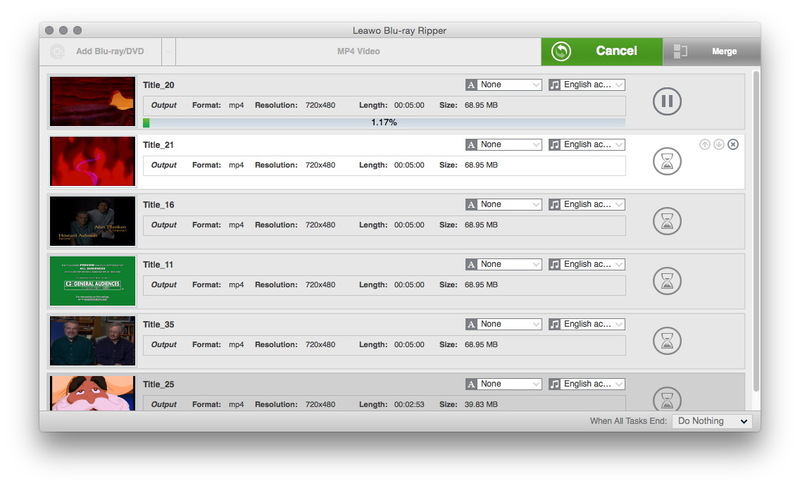 One of the best DVD rippers in the market is Leawo Blu-Ray Ripper for Mac, which is the coolest tool to rip DVD movie to iTunes Mac users highly recommend. 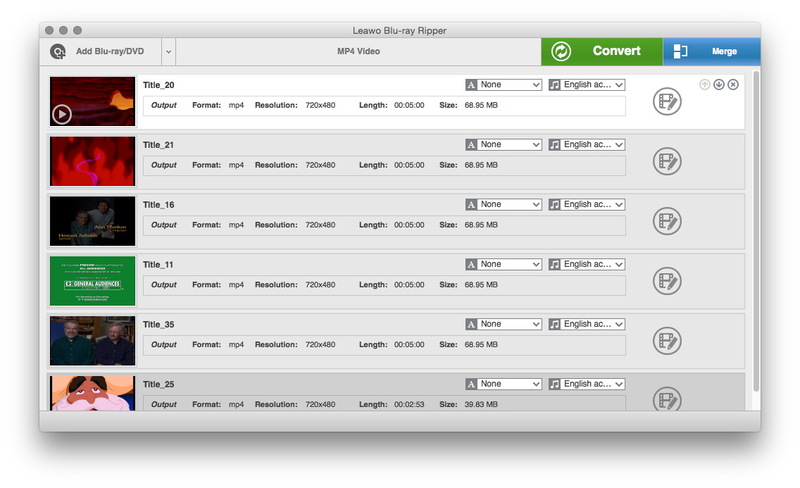 Leawo DVD Ripper is one of the best well-known DVD to iTunes converter to help you rip movies from DVD to iTunes with fast speed and high quality. Far more than a DVD to video/audio converter, Leawo DVD Ripper can be treated as a DVD player, a DVD editor, and a 3D movie creator. Besides, it can help you trim video length, add video watermark, crop video size, and adjust video effect. 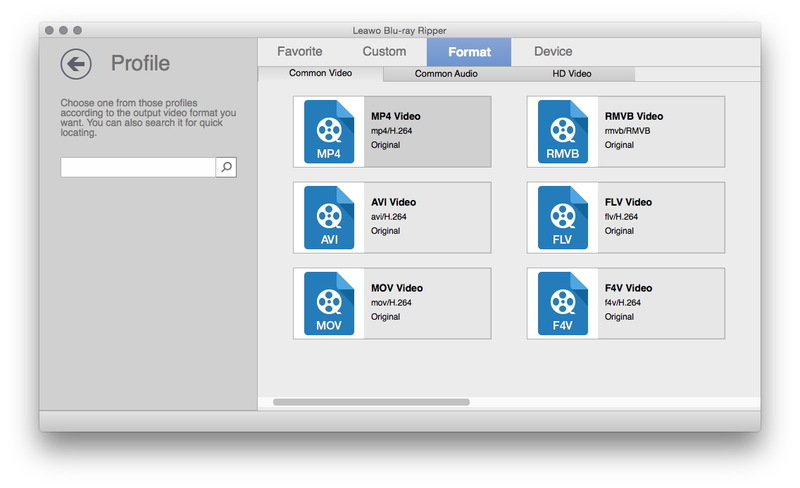 If you are eager to know more, check out to find out how to rip movies from DVD to iTunes Mac version of Leawo DVD Ripper won’t disappoint you. After downloading, installing and launching the Leawo DVD Ripper for Mac, You can click the “Add Blu-ray/DVD” button on the sub-menu bar to import source DVD files. As there are 3 different DVD movie to load modes, choose the one you need: Full Movie, Main Movie and Custom Mode. Full Movie is to import all titles, and Main Movie is to import the longest title by default. Custom Mode is to choose titles for importing. Once the source files are imported, you are able to preview source files via the inbuilt media player. Click the drop-down box next to the “Add Blu-ray/DVD” button, select “Change” to enter the profile panel. In the Format menu, choose MP4 file, so you can add this file to your iTunes library. This step is optional if you want to keep the movie originality, skip the step. Anyone who would like to personalize the converted DVD videos, Leawo DVD Ripper offers some useful edit functions. You can reset the Codec, Video Size, Sample Rate, Frame Rate, Audio Channel, as well as Video/Audio Bitrate, etc to make your videos more enjoyable. To set parameters you need, enter the Profile Settings panel by clicking the same drop-down box and then clicking “Edit” option. Get back to the main interface of the program, click the big green “Convert” button, then it will pop up a sidebar with “Save to” option. Set output directory and other settings according to your actual needs. 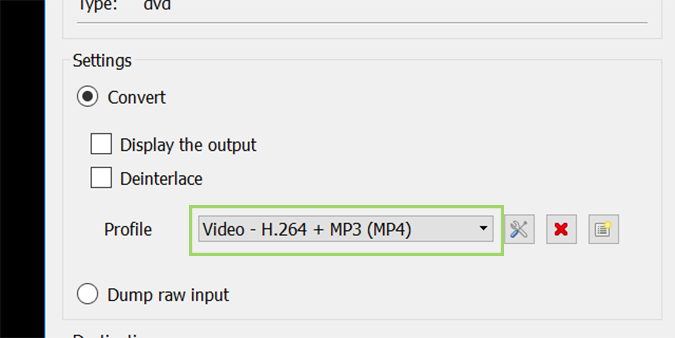 After finishing the above steps, just click the bottom “Convert” button to start converting DVD to video on Mac. 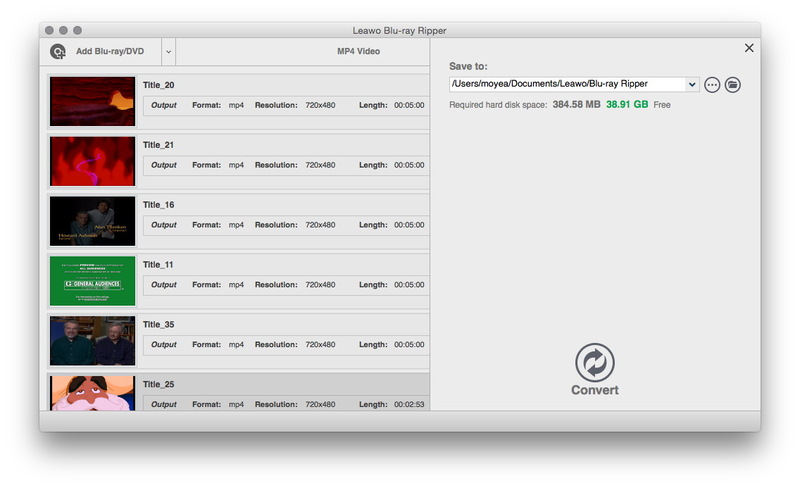 When Leawo DVD Ripper for Mac finishes ripping, you’ll have a .m4v file. 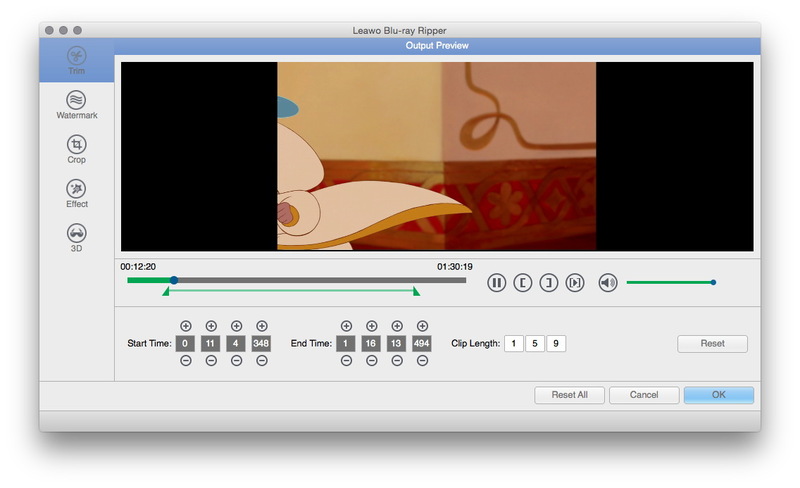 Leawo DVD Ripper comes with a specially designed built-in video editor allowing users to make stylish iTunes movies. With this powerful program, you can easily rip videos from DVD disc to iTunes supported videos for playback on your iPhone, iPad, and iPod touch. HandBrake is a powerful program that can help rip movies from DVD to iTunes, and it also comes with presets to optimize the DVD for your Mac or iPad. You can also optimize it for your iPhone, AppleTV or other formats. It is capable of processing most common multimedia files and any DVD or BluRay sources that do not contain any kind of copy protection, which is simple, easy and fast. Step 1. Insert the DVD in the external drive, download and launch Handbrake, select the DVD, then wait a few seconds for the programs to read the disc. Step 2. Once your DVD is open, head to the “Title” dropdown box and choose which title you want to rip DVD movie to iTunes. Step 3. click “Browse” to pick where you would like to place the movie after you have ripped it in the Destination. Step 4. At the right side of the Handbrake window, you can notice a selection of Presets. In the presets, you can find nearly anything that you need: Apple TV, Android phones, PlayStation, and lots more. Set the ones you need. Step 5. After you have chosen your Title and Preset, click “Start Encode” at the top of the window to start ripping. At the same time, You’ll see a progress bar along the bottom letting you know how much time you have left in the rip. In a word, Handbrake could do a great job to rip unprotected DVDs. But it has no ability to decrypt commercial Blu-ray disc, if you are seeking for an easy and quick way to start the conversion of protected DVDs with ease, why not turn to Leawo DVD Ripper? VLC is a free and open source cross-platform multimedia player that can play almost all multimedia files as well as DVD, Audio CD, VCD, and various streaming protocols. Undoubtedly, to rip DVD movie to iTunes, VLC is a good choice, owing to its powerful and well-loved application. Follow the method on how to rip movies from DVD to iTunes. Step 1. Download, install and launch VLC. Step 2. In “Media” menu, select “Convert/Save.” . Step 3. Click on the “Disc” tab, and choose the “DVD” option under Disc Selection. Step 4. Set the DVD drive location. Step 5. Then click “Convert/Save” option at the bottom of interface. Step 6. To make it possible to play in iTunes, select the codec and particulars in the “Profile”. Step 7. Select “Browse” and set the destination and filename for the ripped files. Step 8. In the end, click the “Start” option in the lower right to begin ripping the file. 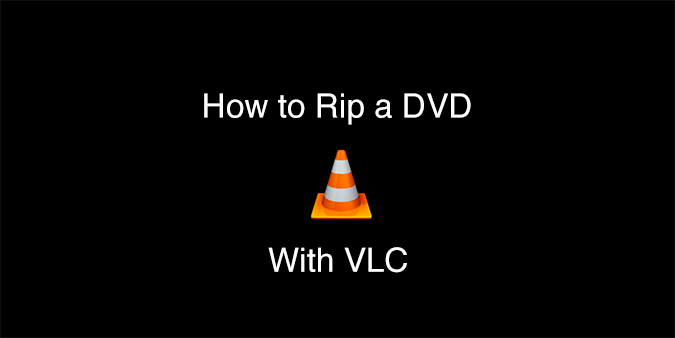 Though VLC is a powerful tool, it cannot rip movies from DVD to iTunes perfectly, especially with some advanced and complicated options. Step 1. Download and launch MakeMKV, insert a disc in your optical drive. Step 2. MakeMKV will read the disc, wait for a few minutes, then it will display its contents. Step 3. Then it lists the disc’s titles (video files) and their accompanying audio and subtitle tracks. You can choose “Unselect All” to clear out the clutter, and pick the titles you want. Step 4. Choose an output folder. I highly recommend one on your local hard drive, for faster conversion. Step 5. Hit the “MakeMKV” button, and wait for the program to create the file you need. Now that you have the DVD on your Mac and in the right format that you need actually, how to rip movies from DVD to iTunes Mac user wants to figure out? To add ripped movies from DVD to iTunes in Mac, first you need to download and launch iTunes, choose File -> Add to Library, then select the file you prefer to add, or drag the files into the appropriate icon. In the end, iTunes will automatically add it to your library. And you can watch them on Mac. Therefore, if you really want to rip DVD movie to iTunes for your iPhone, iPad or Mac, it is really wise to try these professional DVD rippers that can help you convert DVD to iTunes supported video formats. Then you can feel free to sync all your DVDs, and watch them anywhere. What is more, you also don’t need to waste some space to keep a rather large DVD collection.